Studying an animal model of frontotemporal dementia (FTD), researchers have discovered a big neon sign pointing to lysosomal dysfunction–autofluorescent aggregates. The finding, reported in the September 10 Acta Neuropathologica online, again flags something amiss with the cellular garbage disposal system. Senior author Adrian Isaacs and colleagues at University College London document similar aggregates in the brains of people who died of FTD. All carried a mutation in the CHMP2B gene, the basis for the mouse model. Products of other genes linked to FTD, including progranulin (PGRN) and TMEM106B, also localize to lysosomes, Isaacs pointed out, suggesting that organelle as a key nexus in multiple forms of the disease. Rare CHMP2B mutations that disrupt or delete the protein’s carboxyl terminus cause familial FTD (Skibinski et al., 2005; Lindquist et al., 2008). CHMP2B encodes part of an endosomal sorting complex, ESCRT-III, that helps shepherd endocytic cargo into the lysosome. Materials such as surface receptors and their ligands travel through endosomes to lysosomes to be digested. Scientists have observed that the truncated form of CHMP2B interferes with endosomal trafficking in cell culture (van der Zee et al., 2008). The Isaacs lab previously generated mice expressing mutant or wild-type CHMP2B. 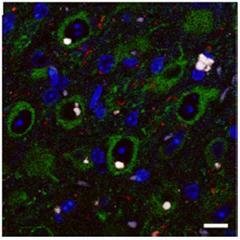 The mutants developed neurodegeneration typified by gliosis and inclusions containing ubiquitin and the ubiquitin-binding protein p62 (Ghazi-Noori et al., 2012). The researchers noticed something else in the brains of the mutant mice: large autofluorescent aggregates reminiscent of those seen in lysosomal storage disorders. In the current work, first authors Emma Clayton and Sarah Mizielinska examined these aggregates in detail (see image at right). 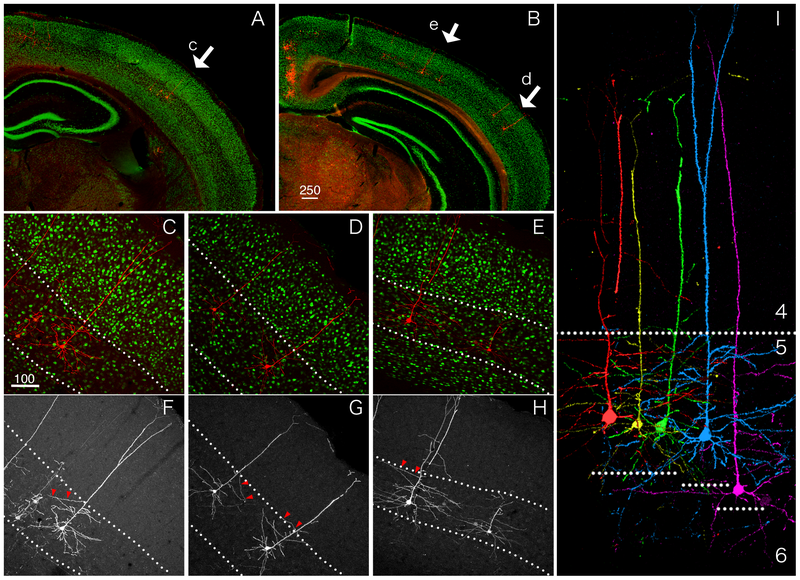 Simply finding autofluorescence in the brain of an aging mouse would be no surprise. Autofluorescent lipofuscin pigments, composed of peptides that cannot be degraded, accumulate in aging cells (Katz and Robison, 2002; Brunk and Terman, 2002). Indeed, by 18 months of age the brains of CHMP2B mutant and control mice had accumulated the small, granular structures typical of lipofuscin. However, Clayton and Mizielinska observed the larger masses in the cortices and thalami of CHMP2B mutant mice as young as 3 months, and more of them as the mice aged. Two scientists not involved in the study, Alice Chen-Plotkin of the Perelman School of Medicine at the University of Pennsylvania in Philadelphia and Fenghua Hu at Cornell University in Ithaca, New York, agreed that the morphology of the large aggregates was distinct from typical lipofuscin granules. Notably, these inclusions were different from those containing p62. While p62 inclusions predominated in oligodendrocytes, the autofluorescent aggregates were most prominent in neurons and glia. Isaacs believes these aggregates, rather than p62, are the major pathology in FTD due to CHMP2B mutations. What could be in these blobs? Co-author James Edgar of the University of Cambridge in the U.K. saw in the electron microscope that they were membrane-bound, often located near endosomes and lysosomes, sometimes with membranous whorls characteristic of those organelles. Moreover, immunogold labeling spotted the late endosome and lysosome markers LAMP-1 and LAMP-2 in the membranes surrounding these aggregates. Next, the authors turned to preserved frontal cortex samples from five people who died of FTD due to CHMP2B mutations and five age-matched neurologically normal controls. A researcher blinded to where samples came from evaluated them for the presence of normal, small lipofuscin structures and the larger aggregates. Neurons of FTD cases contained the latter, while controls had only the former. 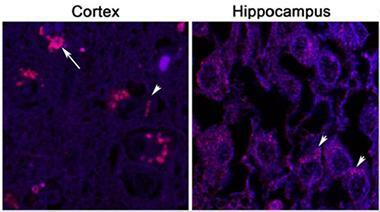 For comparison, the authors also checked the hippocampus, where only small lipofuscin granules appeared (see image at left). Again, Hu considered the morphology of the large aggregates in people to be different from regular lipofuscin, and said she was interested to know the molecular contents of the masses. Isaacs and colleagues plan to find out by combining laser-capture microdissection to pluck out autofluorescent clumps with mass spectrometry to identify their components. It remains possible they contain lipofuscin itself, albeit in a different kind of cellular structure, he said. Even without that information, Isaacs concluded that CHMP2B dysfunction makes the endosomal-lysosomal pathway go awry. “Clearly, that is going to be detrimental to the neurons,” he said. Neurons rely on healthy lysosomes not only to get rid of garbage, but also for recycling of nutrients and cell signaling. “Multiple signs, including CHMP2B, point to the lysosome, and maybe autophagy systems, in FTD at this point,” said Chen-Plotkin. For instance, while people with one bad copy of progranulin develop FTD (see Jul 2006 news), those with two faulty PGRN genes get a lysosomal storage disease called neuronal ceroid lipofuscinosis (Smith et al., 2012). Progranulin co-localizes on lysosomes with TMEM106B, identified as an FTD risk factor in a GWAS, which controls lysosomal size, trafficking, and function (see Feb 2010 news; Stagi et al., 2014; Brady et al., 2013). Hu suspects lysosomal defects could be a common mechanism in all FTD, and perhaps other neurodegenerative conditions as well. Supporting that notion, when Isaacs and colleagues examined brain tissue from three AD cases, they saw less lipofuscin but more large aggregates than in controls, though less extreme a change than in the FTD brains. Isaacs predicted others might find the same large lysosomal aggregates once they look beyond CHMP2B FTD. Clayton EL, Mizielinska S, Edgar JR, Nielsen TT, Marshall S, Norona FE, Robbins M, Damirji H, Holm IE, Johannsen P, Nielsen JE, Asante EA, Collinge J, FReJA consortium, Isaacs AM. Frontotemporal dementia caused by CHMP2B mutation is characterised by neuronal lysosomal storage pathology. Acta Neuropathol. 2015 Oct;130(4):511-23. Epub 2015 Sep 10. [PubMed].